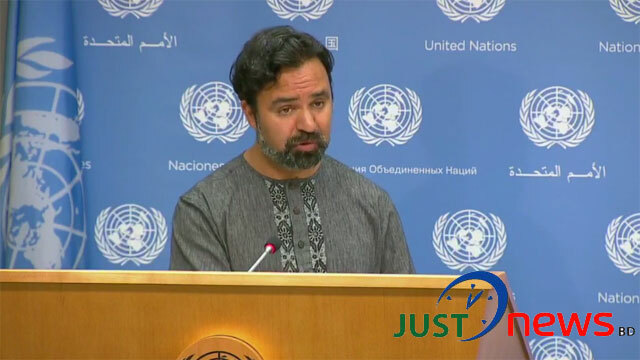 UN correspondent from New York, Aug 6 (Just News): Expressing deep concern in ongoing student movement in Bangladesh, Farhan Haq, Deputy Spokesman for the Secretary-General, has said UN urgently calls upon all parties to keep everyone — including children and young people — safe from any kind of violence. About renowned photographer Shahidul’s arrest the Spokesman said UN would encourage the Government of Bangladesh, as well as all Governments, to respect the rights of the media. In reply to another question on UNHCR official’s death he said this will be promptly and thoroughly investigated. Deputy Spokesman for the Secretary-General came up with this comment in reply to a question on ongoing Bangladesh situation at the noon briefing held at UN headquarter on Monday. After the briefing of the Deputy Spokesman another briefing was held by Brenden Varma, Spokesperson for the President of the 72nd Session of the General Assembly, at the same place. 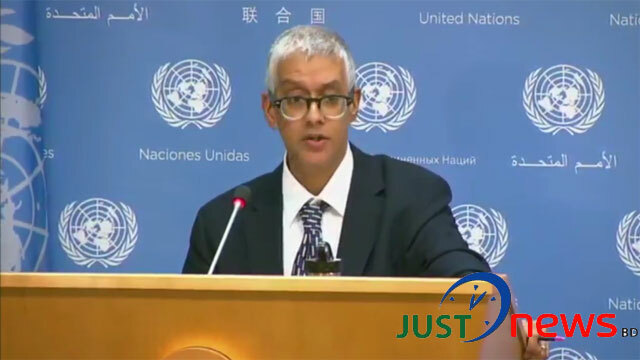 On Bangladesh issue Brenden Varma said President of the 72nd Session of the General Assembly following the Bangladesh situation very closely. He expects national authority will follow respect, human rights, human dignity and follow improving global road safety is as an iron of general assembly’s agenda. So its remains as an important issue for president as well. In the first briefing Bangladeshi journalist and UN correspondent M Mushfiqul Fazal asked, “I think you are aware of the horrible situation going on in Bangladesh. Students are in the street, the school‑going students, they are in the street, and they're protesting. They're demanding road safety, but police and law enforcement agencies are attacking the students. Not only the police, the student wing of the ruling governing party Chhatra League, they're attacking the students. They're shooting, and students are abused, sexually abused the girls, and horrific situation is going on in Bangladesh, as I said. What is your observation, and how is the UN looking? And, secondly, the… one of the renowned photojournalists, he was picked up by the law enforcement agency. More than 21 hours he was disappeared, so now they produced him in the court and he's… the police remand. Just, he appeared in the Al Jazeera, he discussed as far as going on in Bangladesh. So what is your observation on these issues? And I have another follow‑up I'll ask next”. In response Deputy Spokesman for the Secretary-General said, “On this, what I can say, I would draw your attention to what the United Nations Resident Coordinator in Bangladesh, Mia Seppo, has said. What she had made clear is that "We are deeply concerned about the reports of violence and call on all for calm. The concerns expressed by youth about road safety are legitimate and a solution is needed for a mega city like Dhaka." She also said that "a functioning transport system should ensure the safety of all, including children, young girls and women". And the UN urgently calls upon all parties to keep everyone — including children and young people — safe from any kind of violence. And regarding your question about the journalist, of course, we would encourage the Government of Bangladesh, as well as all Governments, to respect the rights of the media”.